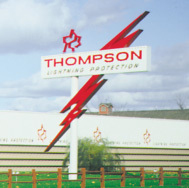 Thompson Lightning Protection is a fully integrated lightning protection system provider. We manufacture our own UL listed and approved components. We have the capacity to custom manufacture material components to satisfy any unique or “one-off” specialty application. We have the staff and expertise to design systems for any type of structure or facility. We have our own in house installation crews that can install systems anywhere in the country. We have a nationwide network of factory representatives and affiliated dealer contractors who can work with you directly in your local area. The same major groups of components are used to install lightning protection systems on industrial, commercial, and government facilities and structures as are used on residential systems. Learn about the five basic elements in a lightning protection system for a residential or light commercial building. We at Thompson Lightning Protection have a long history of working well with a wide variety of government agencies to satisfy their unique lightning protection requirements.